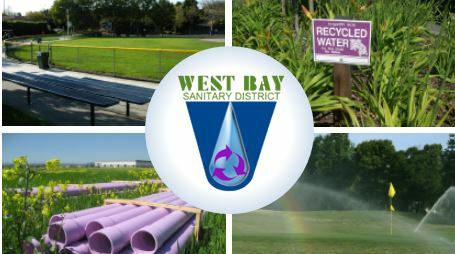 West Bay has completed a feasibility study exploring the viability of a Resource Recovery Center at the District’s former treatment plant behind Bedwell Bayfront Park, which could produce 500,000 gallons per day of recycled water for reuse. Recycled water from such a facility could potentially be used for irrigation, industrial purposes, firefighting, public fill stations and even for flushing toilets in the Bayfront (M-2) area. This regional approach would be sustainable, less expensive and available to a broader user base than expensive onsite treatment systems. The study explored costs, challenges, funding opportunities and the complexity and duration of the project. As California comes out of its most severe drought in recorded history, California communities must get creative about how water is used. Recycled water projects present a unique opportunity to reduce potable water use by reusing water for non-potable purposes, including outdoor irrigation. The West Bay Sanitary District “Recycled Water Project – Sharon Heights” will help reduce potable water use by constructing a satellite recycled water treatment facility at the Sharon Heights Golf Club (SHGCC) to use recycled water to irrigate the golf course and also to potentially serve water to the Stanford Linear Accelerator Center (SLAC) for irrigation and industrial uses such as for cooling towers. West Bay Sanitary District is implementing the “Recycled Water Project – Sharon Heights” as a two phase project involving, the construction of satellite treatment facility designed to treat a max day flow of 0.5 Millon Gallons a Day (MGD), a wastewater pump station to divert flow to the treatment facility, 1,580 LF of pipeline to discharge solids to an existing sewer, a recycled water distribution line to SHGCC irrigation water storage pond, and 5,300 LF of distribution pipeline to Stanford Linear Accelerator Center (SLAC) (second phase). The Project would deliver an estimated 80 MGD of recycled water, including 52 MGD to Sharon Heights through the year and, in the second phase, approximately 28 MGD over seven months to SLAC for irrigation and cooling tower uses. RFP that was sent to the shortlisted teams (3). See list.